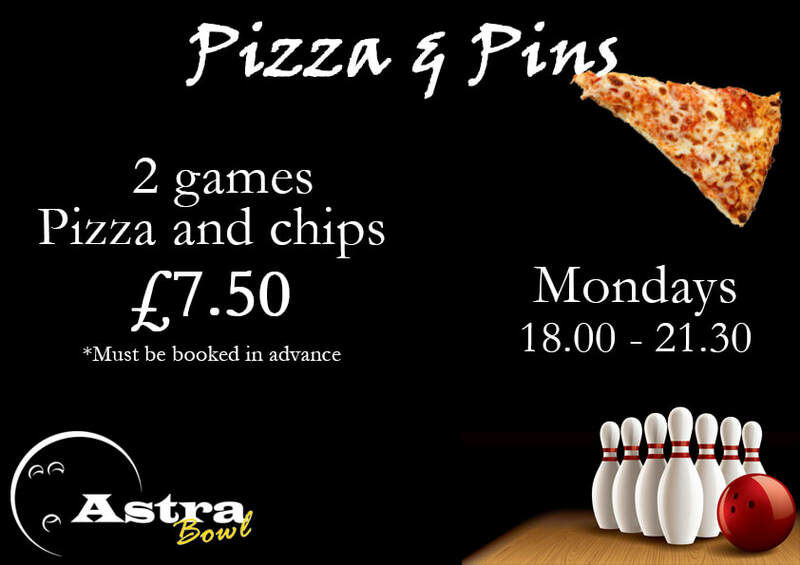 RAF Brize Norton’s Astra Bowl is the largest bowling alley in the RAF and is established as a major welfare amenity for all service personnel especially those who are either posted to or attached to RAF Brize Norton. The 'Bowl' is headed by a dedicated team supported by two civilian managers who run the bowl on a day to day basis. The bowl is funded using income from its very popular snack bar, its licensed bar and of course from our many supportive members and visitors bowling spares and strikes! If you require a fun bowling event we can offer special deals for sections, sqn’s or wings who wish to bowl either in the day, evenings or at weekends subject to lane availability. For the kids; we can also host bowling birthday parties. Please can we remind all our customers that ID cards are to be worn on display whilst you are on RAF Brize Norton. The Astra Bowl is a Challenge Zone where ID cards will be checked randomly. Cars should be parked within marked bays and display a valid car pass. If you are entitled to use a disabled bay then the relevant blue badge must be on display. ​Thank You for your continued cooperation. Supported by the RAF Charitable Trust we now have 6 brand new QubicaAMF ball return hoods to replace the very worn Brunswick ones. I think you will all agree they look great! Entries are now being taken for the 12th Santa Singles, to be held on 22 December. ​​​Please see our upcoming tournaments section for the entry form. On Wednesday 7 November the annual house championship was held. This was the 4th year of the competition and is only open to current league bowlers. We had a great turn out of 27 bowlers this year. 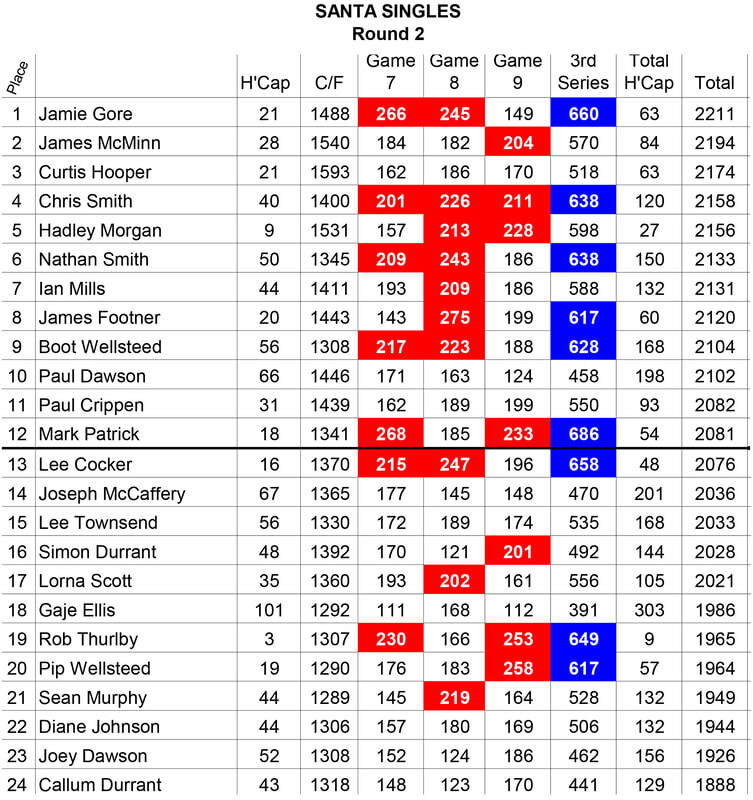 The format was very simple, all bowlers played 3 games with handicap and the top 4 then qualified for a shootout finals where the lowest score drops out after each game. Congratulations to all that took part and to Pip Wellsteed for winning and becoming this years House Champion. 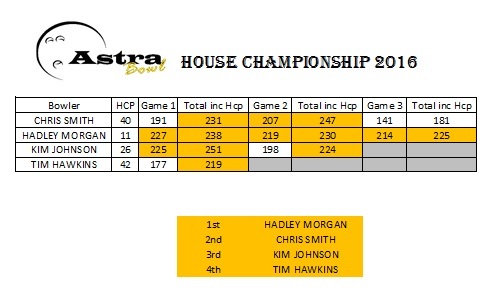 Entries are now being taken for this years House Championship. Please see our tournament section for details. Leaguesecretary.com updated their web servers at the beginning of the year and therefore older versions of BLS were no longer able to upload league data. We have now updated our BLS-2016 program to the latest version, BLS-2019. This now means that we are once again able to upload our league data to leaguesecretary.com and continue to provide all our league bowlers with up to date Standings and statistics. Simply visit leaguesecretary.com and enter your league ID or visit the league section of our site. 1 August 2018 during the Wednesday Night Trios' League Wayne Willacy bowled a 300 in the 2nd game. 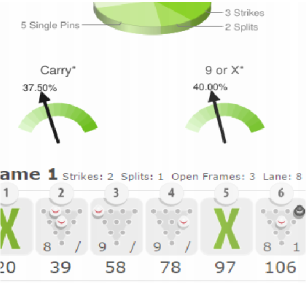 This is Waynes' third perfect game he has bowled here. Well done Wayne, great bowling. To see his final strike check out the video. Now in it’s 12th year the Lez Rogers Memorial Doubles took place at RAF Brize Norton over the weekend of the 13th – 15th of July. Lez was an Airforce Sergeant and Wales’s top tenpin bowler at the time of his death, aged just 38 and about to represent Wales at the Commonwealth Championships in Melbourne, Australia when his life was cut short. Last year was the first time the tournament had been staged at RAF Brize Norton and it was such a success it was decided to put this year’s event there again too. It got off to a sad start due to the untimely death of our scorer and Tenpin Bowling Association of Wales web master Brian Burdett just the night before the event. A quiet character who always worked tirelessly behind the scenes to keep the scores and statistics up to date, he will certainly be missed by all the bowlers. RAF Brize Norton is a 12 lane bowling alley and everyone attending needed a pass to get on to the base, these were duly organised by Bowl manager Steve Morgan. Last year saw 88 entries but due to a clash with the Air Tattoo in Fairford meant that some were working, resulting in 81 teams. All teams play 6 games each and the highest scores plus handicaps are declared the winners. The first squad started at 6pm on the Friday and saw some great scores from Dave Wellsteed which meant him and son Pip were leading with 2773. The tournament raises money for the British Heart Foundation from just entries alone and this total plus the money from two raffles over the weekend saw over £600 raised last year. The Saturday morning squad saw the lead change to local bowlers Dave Chapman and Chris Smith shooting 2822. A fantastic display from top Welsh lady bowler Louise Roberts saw her narrowly missing the elusive 300 by hitting a 299 in the second squad of the day on lanes 1 and 2. However still other teams put in a good display with the ex RAF team of Vets Southerners featuring Kev Hunter and Paul Caddy shooting 2830 to rise above Dave and Chris. Still the good scores kept coming and Peter Bice, returning after a year lay off due to being knocked off his bicycle, shot 1109. Along with his partner Marilyn Codd they ended up leading on 2865. 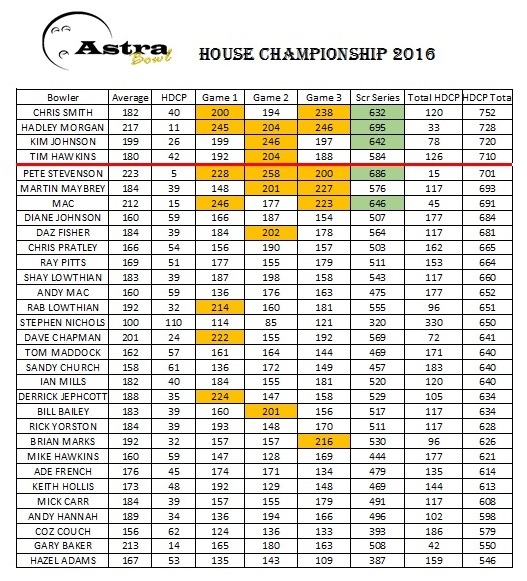 These scores were short lived as Chris Lee shot a creditable 1300 and along with last year’s winner Mike Williams shooting 1135 found themselves leading with 2897. Sunday was another hot day in the bowl and although bowlers tried they could not catch the leaders The Two Crappies (Chris and Mike). They had also previously won this event when it was staged in Rhondda Bowl in 2012. Kay Rogers presenting Sarah MacPherson with a bunch of flowers for her hard workMike Williams has won the event three times and Chris Lee has won it an impressive 4 times, as he won it in 2015 and 2016 along with his Father Tony Lee. Louise Roberts won the High Game Handicap with 325 and High Series Handicap with 814 and her winnings of £50 she has kindly donated back to the British Heart Foundation. Kylie Bromley also sold some square for the Body Shop and donated a further £50 to the Charity. This brings the total raised to £687.60, almost matching last year’s total. I would like to say a huge thank you to my friend, Sarah MacPherson, who kindly stepped in at the last minute to keep the scoring up to speed, Brian would have been proud of you. Not only that but she was also escorting people both on and off base too. Lastly thank you to the bowl manager Steve Morgan and deputy Dave Kirby for the running of the bowl and machinery over the weekend and the Station Commander of RAF Brize Norton for agreeing to us running the vent there once again. Another well attended Santa Singles took place on 23rd December 2017. Congratulations to Ryan Morgan for winning this year and adding his name for a second time to the trophy. A special mention must go to Brandon Roberts for bowling a 300 game in round 2 of the tournament, Congratulations Brandon. ​Thank you to all who took part. ​Please look out for more tournaments on our FaceBook page and see our upcoming tournaments section on our website. 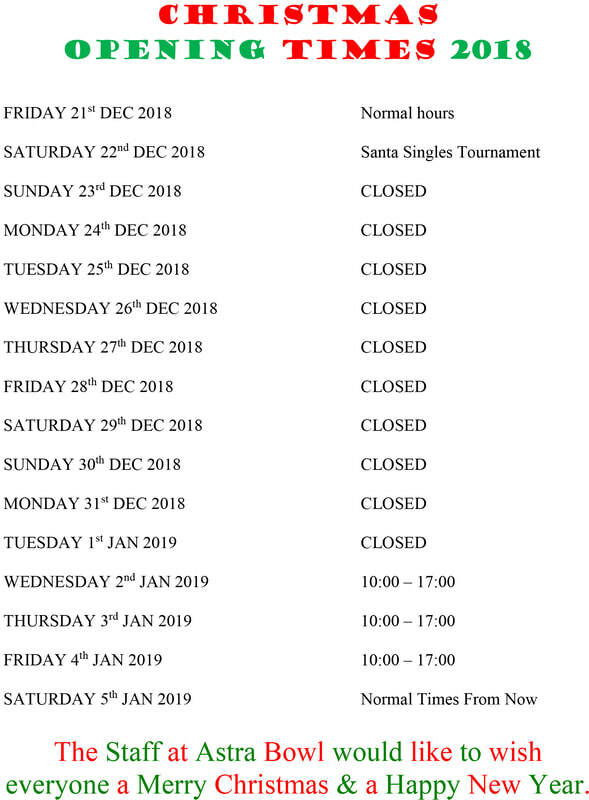 Entries are now being taken for the 11th Santa Singles, to be held on 23 December. ​​Please see our upcoming tournaments section for the entry form. 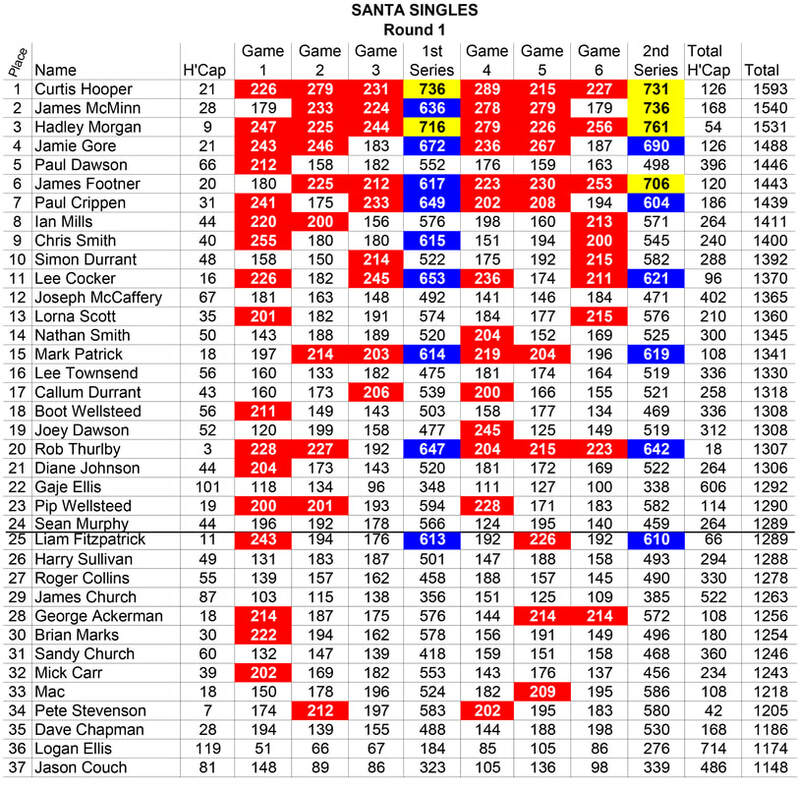 Last years Santa Singles was our biggest yet with 54 bowlers competing over 3 rounds and a step ladder final. Jake Chapman was crowned the winner and also won the tournament in 2014. Lets hope this year is just as successful. Congratulations to Gary Baker and Hadley Morgan on winning this years BTBA Bowler of the Year Awards. Gary was awarded Senior Male Bowler of the Year on the 14 October at a ceremony in Nottingham. Hadley was awarded Adult Male Bowler of the Year on the 4 November also at a ceremony in Nottingham. Congratulations to Hadley Morgan on winning this years London International on Sunday 20 August. The Lez Rogers Memorial Doubles is now in it’s 11th year. It is a tenpin bowling tournament in memory of Lez Rogers, an Air force sergeant from Barry, who died in Melbourne, Australia in 2006, before he could compete in the Commonwealth Championships and was the top Welsh bowler at the time of his death. For the last two years it has been held at Cwmbran but unable to iron out a few issues it was decided to move it to Astra Bowl in RAF Brize Norton, Lez’s first Air force posting. Last year saw 103 entries but due to a smaller bowling alley this year we had 88 teams, helped by putting on an extra Saturday night squad. The first squad was at 6pm on Friday the 21st of July and while it was the smallest of all the squads with just 7 teams it was certainly the noisiest. All bowlers bowl as a doubles team with a handicap based on the entering average and the team that bowls the most with their handicap after 6 games is declared the winner. However it is a tournament with a difference as rock music is played throughout it, the majority of which are songs Lez liked or that Kay and Lez enjoyed in their younger days. The tournament also raises money for the British Heart Foundation and last year raised in excess of £500. This year a special shirt was produced for it with a small donation from each shirt also going to the BHF. The bowl staff worked tirelessly to prepare the lanes all weekend and also man the music too and there was a very cosy atmosphere in the bowling centre. While team numbers were down, the reason for this was due to other tournaments going on both home and abroad but still at 88 teams it was a respectable number. Whilst the bowling was going on there were raffle tickets being sold and two raffles were held over the Saturday and the Sunday. There were some special prizes donated by Lez’s Mum, Brenda Rogers. She had made a Welsh basket full of Welsh food and drink and this was won by Judy Moffat (one of the 20 strong teams from the Big Boys Bowlers Club now regularly entering this event). Brenda had also crocheted a blanket supporting our troops and ironically it was won by RAF bowler, Aaron Clark. Saturday was a busy day and saw some good scores going in with Gruesome Twosome of Andy Preece and Sam Potts taking the lead. By the end of the night the score had been overtaken by the Welsh pairing of Gareth Roberts and Mike Williams. The Sunday squads were all full but there were still some very good bowlers to come. However Gareth and Mike hung onto their lead with 2716 to take the coveted title. Second went to Gruesome Twosome with 2705 and closely followed by Pinheads 2 on 2695, featuring Jason Agate and James Footner. The total raised for the British Heart Foundation this year was £688.25, totally smashing last year’s amount. A fantastic total but thanks to the kind permission of the Station Commander of Brize Norton for agreeing for us to hold this event at RAF Brize Norton it has been made possible. Everyone is already talking about the 2018 event and let us hope we can raise an even higher total. 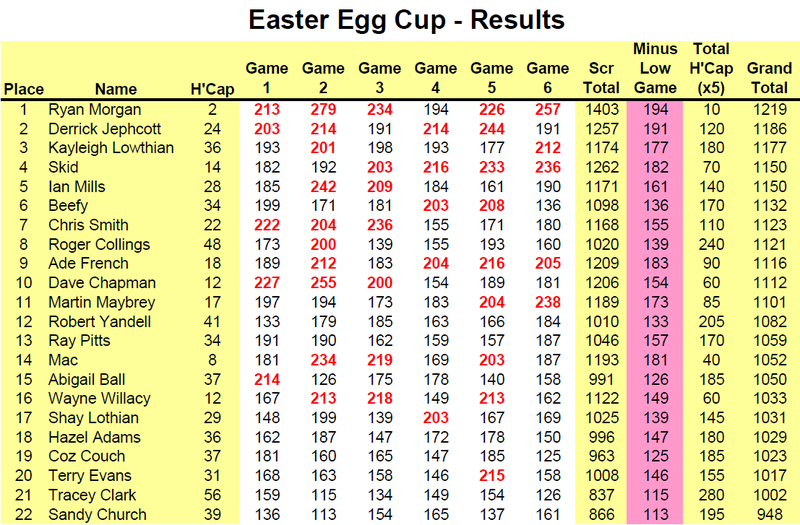 Ryan Morgan bowled 1219 over 5 games to win this years Easter Egg Cup. 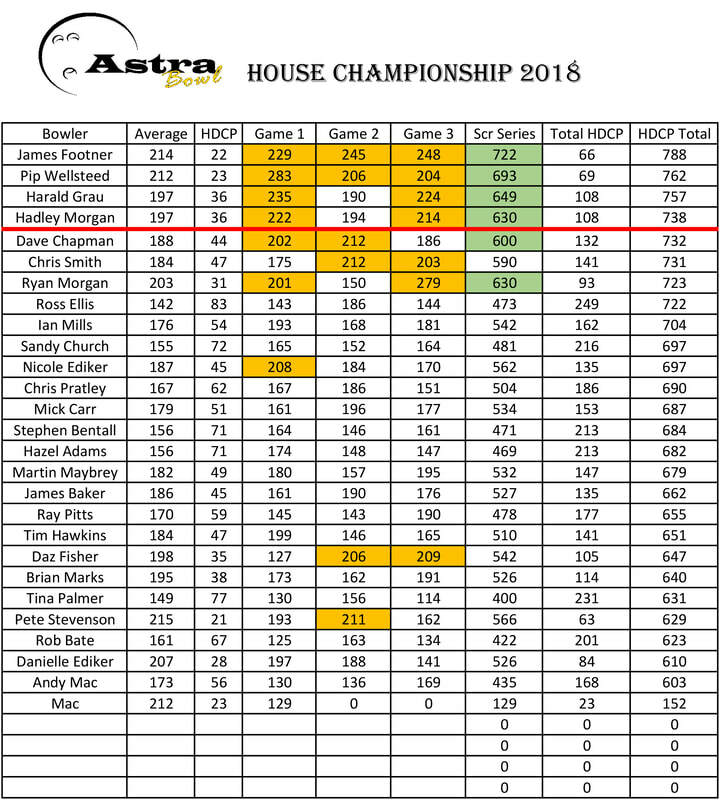 Ryan also won the high game HCP with a score of 281 and the high series HCP (taken from the first block) with a score of 732. 21 April 2017 during the Grand Prix League Chris bowled a 300 in the 3rd game. This is Chris' first perfect game and the first time he has bowled over 700 as a series. Well done Chris, great bowling. Entries are now being taken for this year's Easter Egg Cup, to be held on 22 April. Please see our upcoming tournaments section for the entry form. Entries are now being taken for this year's Lez Rogers Memorial, to be held on 21 July. Please see the Facebook Event for more info. ​ ​Please see our upcoming tournaments section for the entry form. Now in it's 10th year the Santa Singles 2016 was our biggest yet. 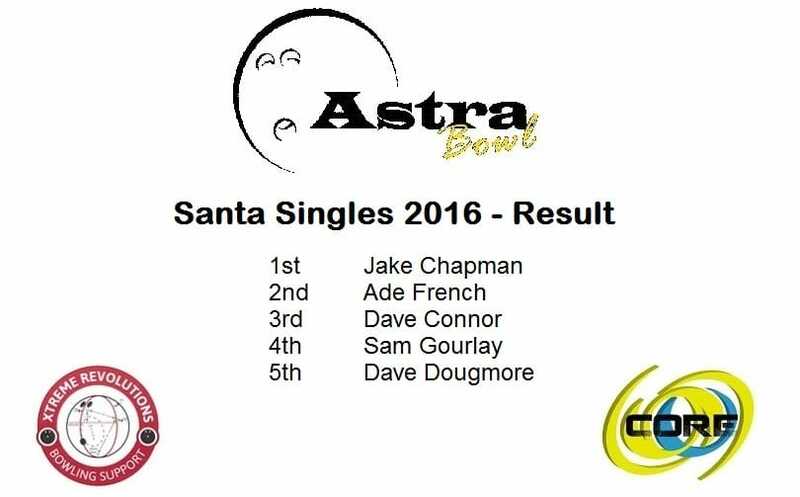 54 bowlers competed on Saturday 17 December over 3 rounds and then a step ladder final, until Jake Chapman was crowned the winner. Jake also won the tournament in 2014 and is the first bowler to win it twice. Sunday 4 December saw 37 teams compete for the annual Thames Valley Wing Air Cadet Bowling championship. The format for is very simple, all teams bowled 4 games and the top 4 male, 4 female and 4 mixed team then bowl a final. Wednesday 9 November the annual house championship was held. Now in its 3rd year and only open to current league bowlers, we had a great turn out of 31 bowlers. The format for this year was very simple, all bowlers played 3 games with handicap and the top 4 then qualified for a lowest drops out final. The beginning of May 2016 saw the arrival of 104 new lockers. 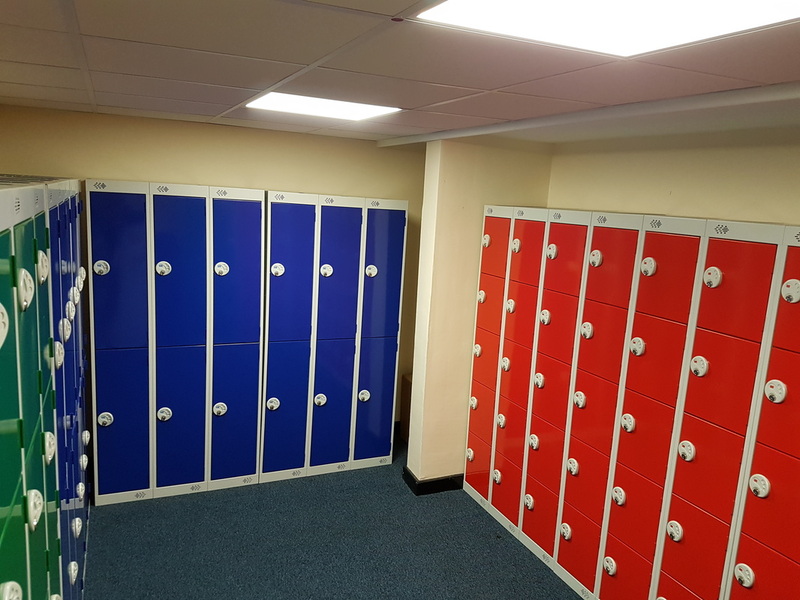 They replace lockers that definitely saw there fair share of use over the last 25 years. There are a mixture of Single, Double and for the first time Triple ball lockers that are available for rent. Real-Time online scoring and analysis! Lanetalk Scoring is an online service that interacts with the score keeping system in the Astra Bowl. Lanetalk AB were the official scoring partner for the 2011 European Men Championships in Germany and are now providing their services to the Astra Bowl. Click the button below to check it out. Steltronic S.p.A. is based in Brescia, northern Italy, where it plans, develops and produces advanced electronic equipment . Also distributed through its Steltronic USA branch in California, USA, Steltronic International Ltd based in London UK and now through the new Australian distributor. 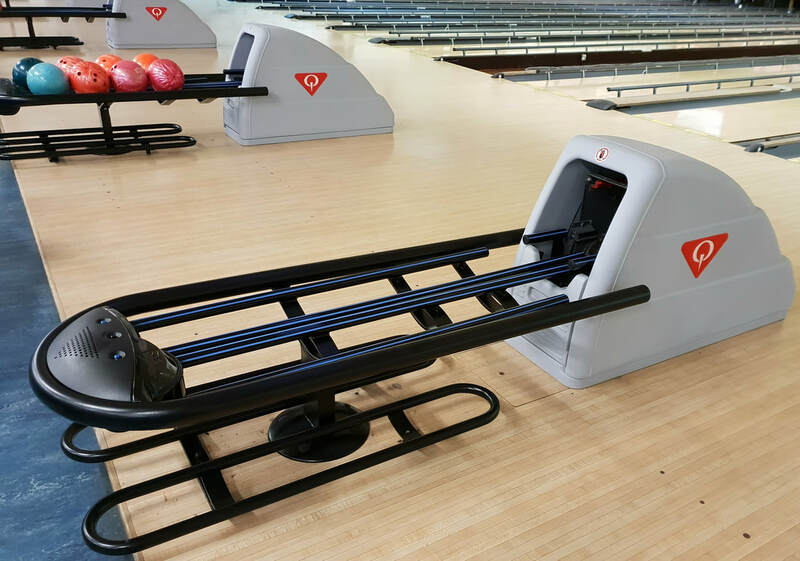 We have been in business for over 24 years, a direct result of all this experience has made us and maintained us the Independent Leader in the field of Automatic Scoring Systems for the bowling industry. 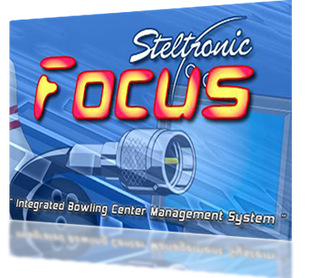 Steltronic pioneered the development of microprocessor systems, optical equipment, and countless other technological innovations - many of the advancements you take for granted in your bowling center. Several years ago, we decided to focus our expertise on something equally challenging: the use of automated scoring systems in the bowling industry. The result? We're proud to say that Steltronic is the independent worldwide leader in automatic scoring. 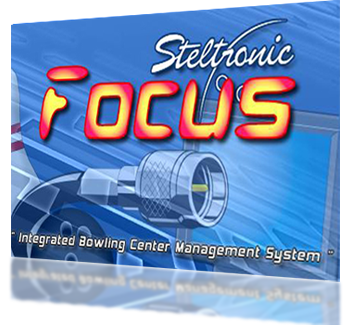 Steltronic has been the leader in scoring innovation for over 20 years. Vision Focus was developed on the latest Microsoft technology and is a fully scalable and user friendly scoring system with interactive real 3D graphics.